This week we are proud to have Bruce and Sophia Chester. 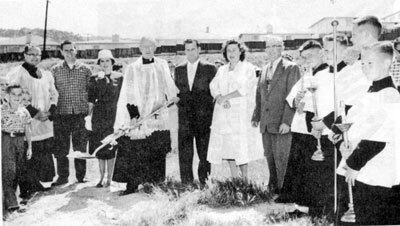 Our relationship with St. Robert�s began in 1971 when we moved to San Bruno from San Francisco. Our children, Michael and Michelle were baptized here. They participated in the C.C.D. Program and received their Communion and Confirmation while attending. I enjoyed teaching the 4th grade C.C.D. class. 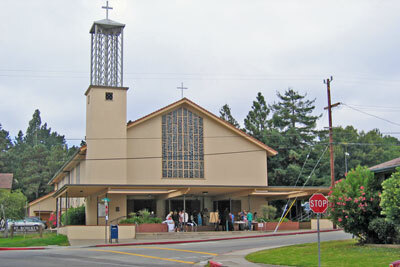 It was a new and interesting experience to teach Religion since I taught at Belle Air Public School in San Bruno. Because of the family�s busy schedules, teaching and my continuing education studies, I only taught the C.C.D. for 2 years. We tried to be actively involved in all aspects of our children�s lives. In 1995, Bruce became very ill with a heart problem and complications. He was hospitalized for a lengthy period. During that time, he was visited by a Eucharistic Minister who talked with him and prayed with him. Bruce was so touched and felt so good that a stranger would take the time to visit and pray with him. A short time later, Bruce joined the Legion of Mary and became a Eucharistic Minister. He now visits the sick and homebound. In 1991, when Wally Mooney became involved with St. Vincent de Paul, so did Pat Mooney and I. We helped organize the holiday gifts and delivered them and food to our needy families in San Bruno. It is still a pleasure and fun to do this. Bruce has since joined and is now the President of our conference. Bruce had to retire from his active job as a San Francisco Cable Car Grip man. He truly misses it but has put his energies to good use. Both our parents had terrible illnesses and deaths. We have sympathy and great compassion for the sick and for those who mourn their loved ones. We have the privilege of ministering to the grieving through the Consolation Ministry. We have taken advantage of some of the many things that our Church has offered to us. We�ve enjoyed helping whenever and wherever we can. We like to have fun too and have done so with the InBetweeners and the Grownups social groups. We are blessed with 2 great children, a loving, supportive family, wonderful friends, good and stable health and successful careers. We thank our parents for their love and the very precious gift of the Catholic Faith that they too, held in high esteem. Without the help of our St. Robert�s family of priests, sisters and friends, we would not be able to live our faith. As a Parish Community we pray �that our nation may return to the belief that all children, born and yet to be born, healthy or handicapped, are precious gifts from God. The last day to register is THIS THURSDAY, October 23rd. Today is Mission Sunday and if any group of people is persistent in prayer, it must be missionaries! All three readings urge us to keep praying, whether or not our prayers seem to be answered. The gospel, of course, is not comparing God to an unjust judge, but rather makes the point that if even a dishonest judge will respond to repeated petitions, surely God who is just and loving will respond to our pleading. I�d like to begin making arrangements for our weeklong trip to Gulfport, Mississippi to help the people still devastated from Hurricane Katrina. Our connection with Gulfport is the Presentation Sisters; they have a convent there and these sisters, as well as the ones in New Orleans, have been involved helping the people who have lost loved ones, homes and jobs. Imagine 60 miles along the gulf from Biloxi to New Orleans with only foundational slabs where there used to be homes! There are still many people living in FEMA trailers, the majority of whom are experiencing Post Traumatic Stress Disorder. Homeowners, including the widow whom we helped last year, have received little or no recompense from their insurance companies. The Mississippians are wonderful and the parish hall where we stay is a true example of community with everyone pitching in with daily tasks and sharing experiences every evening after dinner. We�ll leave Thursday, Dec. 27 and return Thursday, Jan. 3. The plane fare has almost doubled since last year, so if anyone has award miles on Delta which you�d like to donate, we�d be happy to receive them! If you�d like to come, could you please call me at the rectory soon, so that I can give you more details? So far there are five of us going and we�d love to have a sixth. Thanks for giving this some consideration. First of all, thank you for the faithfulness with which you serve God and our parish. Our liturgies would not be as prayerful without you! It�s been a year and a half since we�ve gathered for some input and practical reminders. I realize how very busy all of you are, and yet, several of you commented that you appreciated getting together. I�d like to meet with Eucharistic ministers immediately after all the Masses on Sunday, November 18. I have a commitment on the 17th, but if you serve at the 4:30 pm Mass, I�d like to meet with you on November 3 immediately after Mass. The session will only take 30-40 minutes, but I�m hoping to see all the EM�s at one of these sessions. Of course, if you usually serve at one Mass and are participating in a different Mass one of these weekends, that�s fine! Please mark your calendar. If you proclaim the Word of God as a lector, I�d like to meet with you Tuesday, November 13 at 7 pm. Please come prepared to proclaim the next reading for which you are scheduled. If you can�t make this session, please let me know and I�ll set up another session for those of you who�ll need an alternate time.